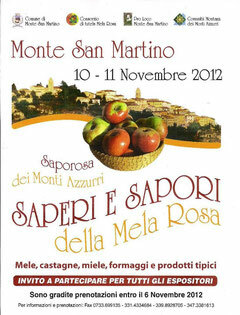 This weekend is the annual Mela Rosa (pink apple) festival in nearby Monte San Martino. This apple is specific to our area, it's small, pink and not very beautiful but it has a delicious perfume and taste plus it keeps for a long time without refrigeration. Hence, it was good for the contadini who would pick the apples, put them in a straw-lined box and place them back in the fork of the tree to keep for the winter. Apples, chestnuts, honey, cheeses and other local products will be for sale. The village itself is a delight with splendid views to the sea and the mountains. For the art lovers, the triptychs by the Crivelli brothers in the church of St. Martin (San Martino) are worth a visit. Not to be missed is a plate of nettle pasta at Dei Priori, a well-known and well-respected restaurant in Monte San Martino.